Special limited edition, 1000 copies numbered and signed by all 4 authors. Part one will be released on the San Diego Comic Con International. Part two will be out in September. This is not going to be distributed by Diamond. If you're not going to San Diego and you want to save your copy of PIXU, it will only be available through KHEPRI.COM. They are already taking pre-orders. 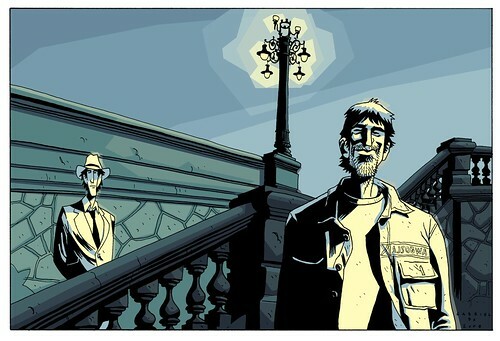 by Becky Cloonan, Vasilis Lolos, Fábio Moon and Gabriel Bá. special edition, 1000 copies, numbered and signed. We just got 3 nominations for the Harvey Awards 2008. You can see the full list on http://www.harveyawards.org/. Winners will be announced at the Baltimore Comic-con, September 27. Special shout for our own Vasilis Lolos for his nomination as Best new Talent and Best Cartoonist!! Warm up for the day. Pencil with TOMBO brush pens. When we discovered TOMBO pens, we were fascinated by the brush pen, and all the different colors. We bought a bunch of pens years ago. Then we realized they are not waterproof, and if you draw with your hand touching the paper, you're going to make a big mess of your drawing. We don't use these pens for any professional job anymore (maybe for some quick storyboards), but we still have a bunch and doing early warm up sketches is all I can think of so we don't waste them and throw them away. PIXU, our new self-published comic, will be ready for San Diego Comic Con, special 1000 copies numbered and signed. 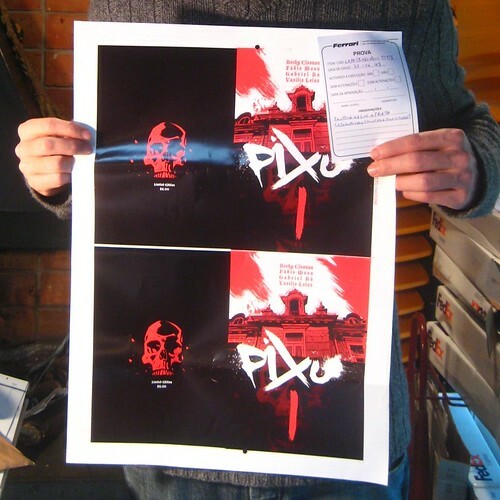 The PIXU crew is Becky Cloonan, Vasilis Lolos, Fábio Moon and Gabriel Bá. It's gonna be a 2 part mini-series and the second one will be out in september. If you're going to MOCCA this weekend, find Becky at table A69 and find more about our new project. And If you're not going to San Diego or if you already want to save your copy of PIXU, you can pre-order it at KHEPRI.COM. Everyone knows Google, but not that many know iGoogle, their enterprise on the "Web 2.0" world, with everything you want on one single page, full of gadgets that let you read news in RSS, the weather, Orkut, Myspace, Gmail, sports, Google Maps, whatever you think of. As a marketing maneuver to spread the world about iGoogle, they've invited several artists from different fields from all around the world to create themes for this page, that the user can pick and have on their own personal pages. Bands (like Coldplay and Beastie Boys), fashion designers (Dolce&Gabbana e Oscar de la Renta), athletes (Lance Armstrong), cartoonists (Osamu Tezuka e Robert Mankoff), among many others. The invited us to create our theme and we're very glad to be part of such a incredible project. If you don't know iGoogle yet, just go to Google, click on the top right on iGoogle and give it a try.